Guinea pigs can be vocal pets, producing a wide variety of noises in different situations. 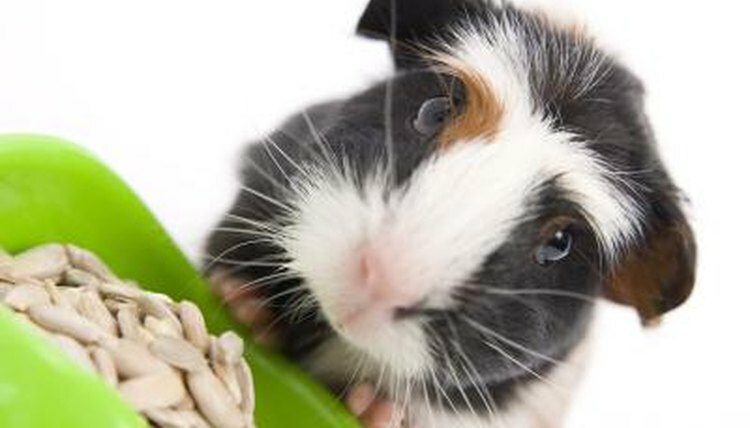 If you find that your guinea pig is excessively noisy when eating, however, it may indicate a problem in the cage or an impending health issue. Most guinea pig noises are simply the pig expressing his contentment to the world. When a guinea pig explores his environment, he naturally makes burbling and grunting noises, and these may carry over into snack time. If the grunts remain low in pitch, and your guinea pig shows no obvious distress while eating, chances are the noises are completely harmless. If your guinea pig grunts and squawks louder when other animals come nearby, he could simply be warning the others away from his food. In a guinea pig herd, one animal naturally becomes the leader, and he gets first choice of food and housing. An alpha pig may eat noisily, dragging his portion of the food away from the other animals and grunting or chattering at them to get them to keep their distance. Similarly, a guinea pig may make noise when another animal attempts to take food away from him, but this tends to devolve into loud, annoyed shrieks rather than grunts. If your pigs seem to have constant personality conflicts that last more than a few days, it could be a sign of a hormonal issue and you should discuss it with your vet. If a guinea pig is excessively noisy while eating and seems to be having difficulty holding food in his mouth, it could be an indication of a dental problem. Guinea pig teeth grow constantly, and you must provide a regular supply of hay to chew in order to keep them worn down. If a molar becomes overgrown, it can make it difficult for a guinea pig to close his mouth comfortably, and eating may be awkward and painful. If your guinea pig is having trouble with his teeth, take him to a small animal expert as soon as possible. A veterinarian skilled in guinea pig medicine will have little trouble filing or clipping your pet’s teeth to restore his ability to eat comfortably. Sometimes, the noises a guinea pig makes can be indicative of serious problems. If your guinea pig makes grunting and hooting noises while he eats or exerts himself, it could be a sign of a heart condition. Certain pulmonary conditions can make it difficult for a guinea pig to clear his lungs, which can lead to noisy breathing and lethargy. Your veterinarian can examine your pig and prescribe medication, if necessary, to help treat the condition.